SpaceRef has a bit more about the NASA GeneBox I posted about last week, that’s on board Robert Bigelow’s Genesis I spacecraft. Including a tiny little photograph. Named "GeneBox", this small payload was developed by NASA Ames Research Center to test out new ways to perform in-flight genomic analysis of living systems. Indeed, much of what is being flown aboard this satellite is cutting edge biotech – the likes of which have yet to fly aboard the International Space Station. Future versions will be even more capable. NASA developed the GeneBox payload and Bigelow Aerospace integrated and launched GeneBox – at no cost to NASA. ARC estimates that GeneBox cost approximately $1 million to fabricate, test, and prepare for flight. GeneBox is an adaptation of the "GeneSat" free flyer nanosatellite. NASA ARC expects GeneSat to cost approximately $6 million to develop. GeneBox was funded entirely by NASA. This effort began with the (now disbanded) NASA Office of Biological and Physical Research (OBPR), then by the NASA Exploration Systems Mission Directorate (ESMD), and currently with NASA ARC internal R&D funds. Of course, NASA’s collaboration with Bigelow is even more interesting in light of news that the agency is thinking about canning its space station research. If you’re as absent minded as me, you’ve probably left home once or twice without your wallet, but with your mobile phone attached to your hip. Well, in the future forgetting your wallet may not matter so much as long as you have your mobile phone, at least where needing cash on hand is concerned. Your mobile phone may serve as your wallet. An electronic reader at the checkout will decode the number and ring up your purchase. Unlike radio-frequency identification (RFID) and other existing contactless payment systems, NFC chips allow two-way information exchange by rolling an RF transmitter and reader into one five-millimeter package. That means the chip can also take in data, such as a receipt zapped to it by a cash register or a bus schedule from a tag embedded in a bus-stop sign. What’s Near Field Communications? Glad you asked. (And if you didn’t, I did.) This definition includes a handy chart. But the NFC Forum has the easiest explanation I’ve found. Near Field Communication (NFC) uses the same principle to link electronic devices. It enables the user to exchange all kinds of information, securely, simply by bringing two devices close together. Its short-range interaction over a few centimeters greatly simplifies the whole issue of identification, as there is less confusion when devices can only "hear" their immediate neighbors. Evolving from a combination of contactless identification (RFID) and interconnection technologies, NFC technology bridges today’s connectivity gap. It enables the simple transfer of information — from phone numbers to electronic transactions — and allows people to interact with their environment without needing to navigate complicated menus or perform complex set-up procedures. I wasn’t sure sure what makes that any different than Bluetooth or wi-fi, but apparently it’s a matter of range. While Bluetooth and Wi-Fi have a range anywhere between 33 feet and 300 feet, NFC deals in inches — eight inches, to be precise. NFC "is designed for shorter distances and lighter content," says Karsten Ottenberg, General Manager of Philips Semiconductors’ Identification unit. Great. There are only two drawbacks I can think of, and one of them has already been shot down. First, I thought I’d have to buy a new phone, but it turns out simple add-on chips will be available and that they’re pretty inexpensive to produce. That just leaves one problem. Would losing your phone become the same as losing your wallet? We love the name MobaHO! That exclamation point captures perfectly the exciting potential of satellite digital multimedia broadcasting. Mobile Broadcasting Corporation (mbco) and Sapporo-based taxi company Daikoku Kotsu will introduce MobaHO!, the world’s first satellite digital multimedia broadcasting service for personal and mobile device use, for taxi customers this month. Taxis are equipped with LCD monitors which come with an internal speaker and are placed on the head rest of the passenger seat. The service will provide taxi customers with a variety of programs such as real-time news, genre-specific music programs and overseas FM radio through 37 audio channels, and seven video channels including news, sports, and entertainment. All programs include ‘taxi ads’ as well. At 100 feet tall and 15 feet across, the Dnepr missile was to carry 18 satellites into orbit. Nearly 200 students, faculty, and members of the public gathered at the Engineering and Physical Sciences building on the campus of Montana State University to cheer the launch from Baikonur Cosmodrome as it was relayed by live video. However, 13 minutes after the launch, a much-anticipated signal from the rocket had not been received. About two hours later, a space news Website posted a story that the rocket had crashed…. The rocket carried MEROPE, Montana EaRth Orbiting Pico-Explorer, which was the culmination of five years of work and waiting by more than 100 MSU students…. MEROPE was a specific satellite design known as a CubeSat. CubeSats are shaped like a cube 10 centimeters (4 inches) on a side and weigh 1 kilogram (2.2 pounds). They were envisioned as student satellites that could be designed, built, tested and launched in the time it takes a student to earn a four-year undergraduate degree. Over its four-month lifetime, MEROPE was to take measurements of the Van Allen Radiation Belt, a donut shaped band of super-charged particles that can kill astronauts and destroy satellites. The belt’s radiation levels and its shape are constantly changing. MEROPE’s monitoring was to contribute to the understanding of "space weather," Larsen said. As Bill Hiscock, head of MSU’s physics department, points out, 95% of the work done by the students took place simply in getting the satellite to the launch pad. So, although the satellite was lost, the educational value of the project for tomorrow’s engineers and scientists was not. Russia’s Federal Space Agency says a first stage engine shutdown caused the crash. This might be a good way of getting rid of excess junk that you have lying around: Send it to space. Earlier this month I posted about the launch of Robert Bigelow’s inflatable spacecraft, Genesis I. Well, via Space Pragmatism comes news of Bigelow’s next big plan. When Genesis II goes up, he’s gonna let you fly your stuff into space, and send you pictures too. Whereas space was once the domain of only the privileged, Bigelow Aerospace is offering the public an exciting new opportunity to reach the final frontier. For the first time, you can actually send an item of your own into space. Your personal selection will be floating inside a spacecraft hundreds of miles above the Earth. If all systems function properly, your personal treasure (be it a photo, ring, bottle-cap or toy) will be floating in space for years. And here is the best part: You might even be able to see it. That’s right! The Bigelow Aerospace spacecraft known as Genesis II will be carrying multiple cameras. Some of these cameras will be viewing areas inside the spacecraft where your prized possession is floating. Everyday, Bigelow Aerospace will be downloading images and video from these cameras to its Website. If you log onto the Bigelow Aerospace Web portal, you will have a chance to actually see your item floating by! And who knows? If the Genesis II spacecraft stays in orbit for several years as we expect, you may see your face (or item) many times over! You can also look inside Genesis and see what’s already gone up (besides NASA’s GeneBox, that is). 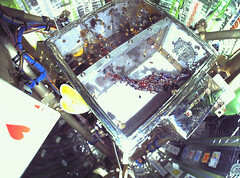 The picture above, by the way, is a box of Mexican jumping beans sent up in Genesis I by Bigelow Aerospace employees. doesn’t contain power-operated devices, liquid, or powder. I’m not sure what options that leaves or whether the price beats a similar program from Masten Enterprises, but at least there’s now another way to send more junk into space. She may not be real, but I’ve got some advice for that girl Emily. If really want to keep track of a straying spouse, track his license plate. Or it could let a suspicious spouse find out if the other half is stepping out. Just one more step in the tracking of everything and everyone. But wouldn’t this be easier with GPS? After all, it works for lost dogs, gang members. Emily could just get her husband a new phone, say from Sprint or Verizon, but that might make him suspicious. (Then again, a billboard is pretty big tip-off.) But chances are he already has a mobile phone and, as I noted earlier, anyone with a mobile phone can be located and tracked. Next time she wants to hit the joint banking account to send a message to Steven, Emily might consider signing on with AccuTracking, World-Tracker, or U-Locate. The more subtle and probably also cheaper than putting up billboards across the country. A while ago, I blogged about Microsoft’s foray into Robotics with its Robotics Studio software. Well the Microsoft robotics march continues, but this time the robots are marching on Microsoft due to a bit of synergy with Lego’s own robotics project. Thanks to the toy company, you can build your own robot. Lego Mindstorms NXT includes LabView software from National Instruments, which lets robot makers program their machines by dragging and dropping icons on the screen instead of writing code. The software works with both Windows XP and recent versions of Mac OS X. Bluetooth wireless signals are supported, so finished robots can be controlled with compatible mobile phones. The Lego Mindstorms NXT kit, which sells for about $250 and is aimed at children age 10 and older, will arrive in stores early [this] month; it can also be ordered at www.mindstorms.com. The Mindstorms kit includes 519 Lego Technic building blocks; sound, light and touch sensors; a 32-bit microprocessor called the NXT Intelligent Brick, which serves as the robot’s brain; and several motors. Batteries, however, are not included: six AA cells are required. Lego, it turns out, was a major inspiration in getting Microsoft into the robotics business. "Lego was one of the motivating factors that got this started in the first place," said Tandy Trower, general manager of Microsoft’s robotics initiative, which launched in June. He explained how Lego had told Microsoft about its Mindstorms NXT plans several years ago, even as Trower was beginning to formulate what his group would be like. Now Microsoft is hoping its robotics suite, which can help people design anything from simple robots to industrial projects, will be seen as an innovative step to getting more people interested in robots. He likens the state of robotics today to that of the early days of PCs. The synergy with Lego might be great, but here’s a heads-up to Microsoft: Lego’s robots may be marching in your direction, but it looks like some robot enthusiasts are turning to Linux. To spur more development of robots at the hobbyist level, Japan’s National Institute of Advanced Industrial Science and Technology (AIST) is promoting a humanoid creature named HRP-2m Choromet. One problem with current robots, AIST says, is that they tend to be little more than remote-controlled devices. Another is that getting beyond that evolutionary stage tends to take a lot of cash. I dunno. Sure, Choromet looks cool. But I’m thinking that Lego robot with the Swiffer attachment (pictured above) would be a lot handier around the house. Hot enough for ya? You don’t have to read the news to know there’s a heatwave going on, even though it’s heating up Europe to the point that some people think houses may collapse (due to subsidence if heavy rain causes the bone-dry soil to expand and move buildings as it does so). And things have gotten so hot in the U.S. that blackouts and power outages are happening in California, Missouri, and New York. All you really have to do is step outside. But if you want the big picture, you can check out Envisat’s satellite pictures of Europe which, according to the BBC, show dramatic increases in land and sea temperatures in the UK. The images were generated from data gathered by the European Space Agency’s Envisat and Nasa’s Aura satellites. John Remedios, head of Earth Observation Science at the University of Leicester, said: "The latest satellite data shows a perspective of the environment in which we live that can only be obtained from space. "The images show temperature increases and increased pollution for every region in the UK." Envisat, an advanced polar-orbiting Earth observation satellite, was launched in March 2002 by the European Space Agency and provides measurements of the atmosphere, ocean, land, and ice. You don’t have to be an astronaut anymore to experience walking in space. All you need is $35 million and the willingness to risk your life. A private Virginia firm that already has sent three super-rich men to the international space station for $20 million each announced Friday it would offer an even rarer adventure: A stroll outside the space station for an extra $15 million. "It is the holy grail of spaceflight; it’s something very few of the astronauts and cosmonauts have done," said Eric Anderson, chief executive of Space Adventures Ltd.
Added former NASA spacewalker Kathy Thornton, who is on the firm’s advisory board: "It’s just sort of the feeling of freedom, that you are your own satellite." With the blessing of the Russian space agency, Space Adventures is arranging for the first spacewalking tourist to go into orbit in about a year or so, Anderson said. The trip would involve a launch in a Soyuz capsule, an eight-day stay aboard the international space station and a 90-minute spacewalk in a Russian spacesuit. An extra month would be added to the six-month cosmonaut training. More information is available directly from the Space Adventures website, where they feature their advertising slug for the offering: "Think outside the spacecraft."